When I was 17 and about to embark on my senior year of high school, my family packed up a car, pick-up truck and U-haul trailer and moved 900 miles from Indiana to north Florida. 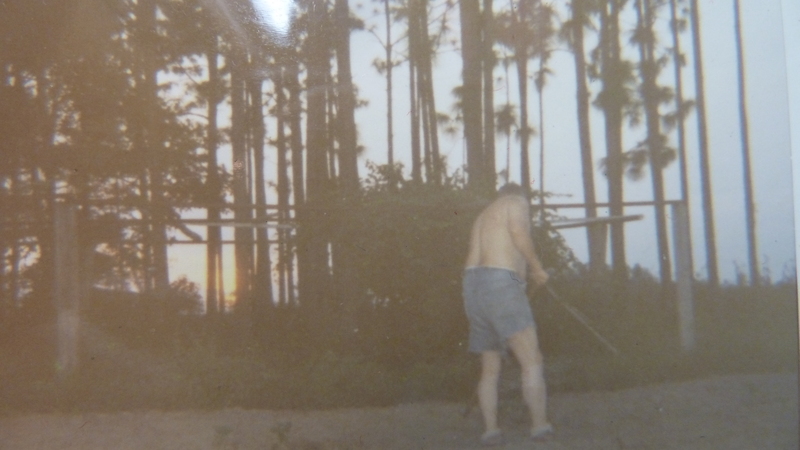 Dad hoeing our garden on flat, north Florida farmland. Now northern Florida is literally more than 1,000 miles away from south Florida and the kind of beach culture you find in Fort Lauderdale or Miami. North Florida is more like living in very rural Georgia or Alabama: Deep South, in everything from accents to attitudes. The year was 1969: the Vietnam War was in full swing, it was the first year of full racial integration of public schools, and just a year after Robert Kennedy and Martin Luther King Jr. had been shot, for reasons not unrelated. So I was the new girl in school; I can still remember one boy glaring at me and spitting out, “Damn Yankee. We don’t need any more of ya’ll down here. If we could fight the war again, we’d win this time.” And it was not the Vietnam War he was talking about. We had a government class called “Americanism versus Communism,” and every day the teacher, Mr. Dickens (name changed) would rant about “g’vment,” religion, freedom, the fortunes of University of Alabama football, and huntin’. Not only was I new and freshly imported from the North, but I was immediately categorized as Mennonite. Everyone knew Mennonites were different. Some of the local Mennonites were different in dress, but others like me were different mainly because of our beliefs. I had lived a very sheltered life near Goshen, Indiana, where most of my friends, teachers and neighbors were either Mennonite, Brethren, Amish, or Conservative Mennonite. I went to the Mennonite high school my first three years and enjoyed a great bunch of friends. My biggest crisis was breaking up with my steady boyfriend shortly before we moved. So even though I was initially excited about the move, once there I felt isolated, lonely, and very different from most of my peers. For the first time in my life, I hated and dreaded school. Still, as a new southern transplant, I was fascinated with his stories. What high schooler wasn’t content to listen to tall tales and loud opinions for an hour rather than buckling down to discussing the assigned reading? At times his logic and opinions made sense, and I realized his mind went deeper than huntin’ dogs and ‘Bama football. He was, after all, editor of the town paper. Mr. Dickens picked up early on my faith background and would buttonhole me with questions like, “How would Mennonites keep communists from taking over our country if it ever came to that?” I remember my face feeling hot as I stumbled for answers. I was raised to be a “nice” girl, so I never thought of it as bullying or badgering or a hostile classroom environment. In our Mennonite family, one of the firm rules guiding our lives was that Sunday was a day of rest. We only did the necessary chores of taking care of animals — and “women’s work” of cooking and washing dishes. Dad, as a rule, would never drive a tractor or do any work that could wait until Monday. But in Calhoun County, a day of rest for humans was also a day when hunters would take their huntin’ dogs and go scouting for deer. One Sunday afternoon in the fall, when the ground was soggy and full from the hurricane season, Dad could hear a vehicle stuck in the mud across the fields. You could hear the tires whirring in the mud. So Dad went out quietly and got his tractor, fetched some sturdy chains, and went rambling down the paths between fields until he reached the source of the sound. Who did he find there but Mr. Dickens and his dogs, with his truck stuck up to its axles. Dad quickly pulled Mr. Dickens’ truck out of the mud. I don’t know if Dad worried about whether neighbors would think he was working on Sunday when they saw him on his tractor. But Dad did tell me he’d found and freed my government teacher. On Monday morning, Mr. Dickens began class with, “I was out huntin’ with my hounds Red and Rowdy yesterday …” and we settled in for what we hoped would be a long diversion from civics, government and religion. “Well, I was out near about the Miller farm,” he said with a nod to me. “And then Whoohie! Fooey! Hot dang! The ole’ truck jes mired down and wadn’t going nowhere, no way. I rocked it back and forth. Of course, it jes made the mud worse, and I knew that, but what was I to do? I was eight miles from town. “And then I looked up and who did I see puttin’ across the fields but Mr. Miller, on his tractor, on a Sunday. And he commenced to putting his chains on my truck and had me out of there in no time at all. And Mr. Dickens never did forget my father’s simple act of kindness. He brought it up often in our discussions of religion the rest of the year. I felt less “on trial” and less suspect in my faith tradition. Dad’s bridge of grace to help someone in a ditch in spite of normal Sunday rules softened the opinion of a curmudgeonly teacher that day—and maybe of this young self-righteous northerner who needed to open herself to be more accepting of anyone, no matter what kind of opinions they expressed or where they lived. I doubt Dad thought of himself as extending grace when he went to get his tractor, but Mr. Dickens’ ideas about Christians, pacifists, and Mennonites would never be quite as hardened. 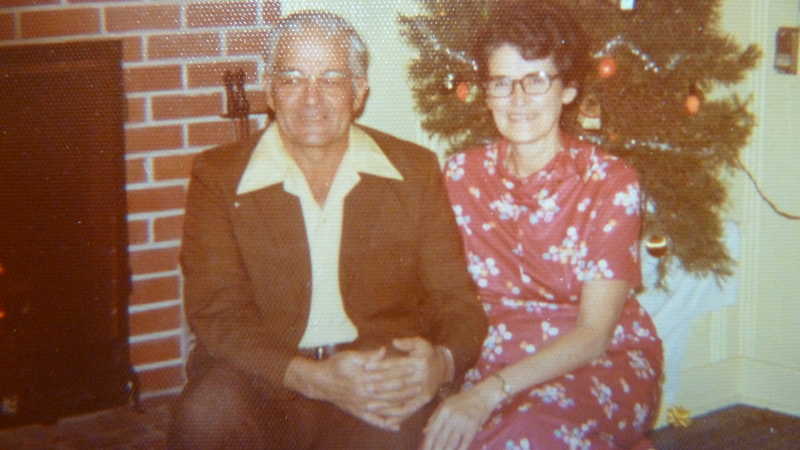 My dad and mom, Vernon and Bertha Miller, circa 1970’s, at our home in north Florida. Finding Harmony Blog featured guest posts this week as excerpts from a just released book, Fifty Shades of Grace: Stories of Inspiration and Promise, published by Herald Press (April 17, 2013). This is my father’s story included in the book. More stories like this: This story and 49 more like it can be found in the new book, Fifty Shades of Grace: Stories of Inspiration and Promise–a great Mother’s day gift or for birthdays, anniversaries, personal devotional, or a book to share with a friend or relative. A 30 percent discount is available until May 1, making the book just $9.09 plus shipping. You can also watch a trailer for the book here and find a news release here. Oh those were the days! Your story brought tears to me as I remember our Dad. Thanks. Aww… I’ll have to send this one to Mom so she can see the photos I posted. I don’t have many good ones from our Florida years. It is one of my treasured stories about Dad. Living our faith is far more effective than talking about it. Very well said, Ann. Thanks.